A totally different experience that is truly made for nature lovers is this tip to explore the amazing rainforests of Flores with its unique flora, fauna and amazing geology. 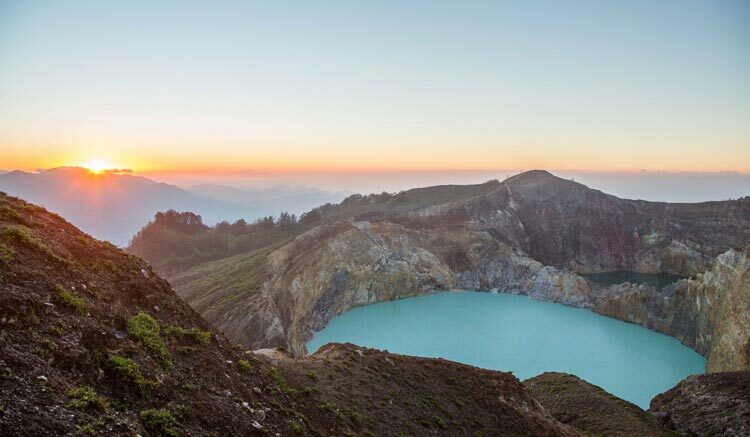 Besides the sheer beauty of nature, you can discover two different amazing worlds of Flores, such as: 1) the spectacular volcanic crater lakes of Sano Nggoang (one of the world’s deepest volcanic crater lakes) and the three colored lakes of Mt. Kelimutu, and 2) the rich and traditional remote cultures of Flores still practicing the rituals of generations past. These areas are certainly off the beaten path, but offer such rewards for those who want to experience this rugged adventure. After arriving in Labuan Bajo, we depart from either your hotel or boat (should you decide to take in Komodo first) by car to Roe village, which is about 21 km. We visit the Waerebo Traditional Village in the province of Manggarai, Flores. We then start here for your 3 hour trekking up through the dense Mbeliling forest and on to Werang. On the way you can see Flores endemic birds, such as the Hanging-parrot, Loriculus Flosculus, Flores Crow Corvus Florensis and many other birds making it a bird-watchers delight! As we explore the pure, native rainforest, we will have contact with many of the local people and enjoy your time by relaxing at Cunca Rami Waterfall. Lunch will be provided by local people in Werang, followed by an afternoon drive to Sano Nggoang Crater. This area consists of slopes and flat ridges which are formed by volcanic activity resulting in a crater lake in the active volcanic mountain of Wae Sano. Dinner and Overnight at local family house. After breakfast, you start the new day by walking around the deep crater lake of Sano Nggoang, feeling close with nature and local people as you go. Once back, we take on an afternoon drive to the Tado community, which is truly a eco-tourism based adventure. Here you can participate with eco-tourism activities by keeping in touch with the local people, joining their activities or requesting certain rituals and programs, such as ancient rituals, jungle survival programs and/or traditional artistry and crafts. We continue the day be arriving at the amazing spider web rice field’s of Lingko, Cara Cancar, Flores. We spend overnight at local family house. After breakfast we drive on to discover the unique southern part of Manggarai with the surrounding landscapes and villages alongside the road. As we drive through the southern coastal community of Nangalili or Dintor, we can relax and swim before driving up to Denge. We can make several stops along the way to view the stunning countryside and rice fields. Dinner and overnight at family house in Denge. After a light breakfast, we start your 4 hours tracking to the amazing Wae Rebo village, which is a classic representation of authentic housing in the Manggarai province located about 1000m above sea level in the middle of a remote mountain range. Still untouched, all the houses are still very traditional with 5-story high roofs that house the storage of goods in the top four floors with all the living areas on the bottom floor. Here you have the chance to reach out with these people and experience how they experience their culture, life and activities. This is a unique opportunity to realize how remote cultures live in the ways of the past and gain an acceptance of who these people are. We will have dinner and stay the night here as they provide sleeping mattresses. Overnight will be at the elderly Florenese women’s home which houses up to 8 families. After the local breakfast, we get on our walking shoes and trek down to Denge village throughout the morning. After enjoying the rain-forest and local scenery, we will have lunch in Denge. After lunch we will drive up to Ruteng with several stops along the way, such as in Narang where they have spectacular rice terraces and beautiful scenery. Dinner and Overnight at MBC Susteran in Ruteng. Flight from/to Denpasar by Garuda Indonesi ,Nam Air or Lion Air.